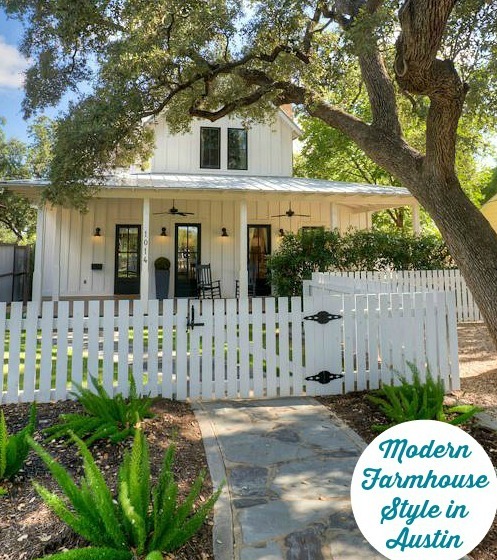 If you love the modern farmhouse style with white board and batten siding and a metal roof, then take a look at this. This newly built home is for sale on six waterfront acres in Urbanna, Virginia, overlooking the Rappahannock River. The views alone could sell me on this one! Contemporary farmhouse-style home complete with Hardie board & batten siding, standing seam metal roof, mahogany double front doors, white oak flooring, screened porch with fireplace, and open cooking porch. Joanna Gaines started more trends besides shiplap. I love the look of them but need more privacy. We get so many sales people canvassing our neighborhood these days that I only answer the door when I know for sure who’s on the other side! The house has 4 bedrooms, 3 full baths, and 4,137 square feet. They really took the outdoor living aspect and water views into consideration when designing this house. “This Brand New Elegant Coastal Custom Home was Built with all the Bells and Whistles! “Coastal Elegance on the Rappahannock” is sited on 6 pristine waterfront acres with expansive wide views and sandy shoreline. A Contemporary Farmhouse Style Home. Want it? They’re asking $1.497 million. Check the listing held by Amy Southard for more photos and information.